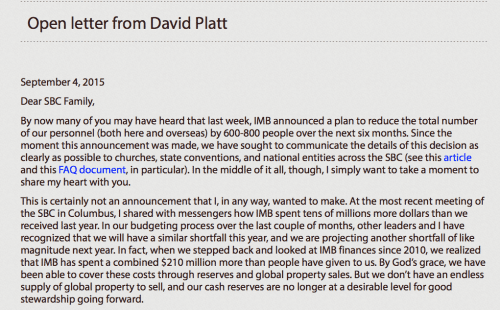 If you have been reading my blog for some time you may recall this post I made highlighting David Platt’s trip to a “secret location” in the Middle East. This location was touted as a place where a Christian could lose his life because of his Christian beliefs. A video was made of several believers living in Dubai who briefly shared interesting stories. They were all members of Redeemer Church of Dubai, and one happened to be the Pastor of Redeemer Church of Dubai. Those in the video had their faces blacked out. It was not actually out of fear for their lives that they did this, but rather for sensationalism – hype, if you will, aimed at increasing book sales for Platt’s latest release. It was disingenuous at best. I called them on it and proceeded to lay out how Christians in Dubai have nothing to fear. I have recently come across some interesting graphics published by Open Doors USA that would seem to support my claims. Below is a chart of the 10 most dangerous places in the world to be a Christian. You will notice that the United Arab Emirates did not make the list. If you go to the list of the top 50 places where it is dangerous to be a Christian the United Arab Emirates is ranked 35th; if you actually go to the source and click on the country you will be presented with facts that justify the ranking of the particular country. I believe the ranking of the United Arab Emirates may be unwarranted because the site readily admits Christians are free to worship in their churches, but not to proselytize Muslims. It is against the law for Muslim UAE citizens to convert to another religion. For this they could be put to death, this however is not a law unique to the UAE. It is a universally applied law to all Muslims. The zeal with which this law is applied differs from country to country, depending on how radical the country is. I have not heard of this law being carried out on anyone in my 5 years in the UAE. My feeling is if some case came to the attention of the authorities they would probably quietly advise the individual they need to leave the country, and this would probably only happen if there was some adverse publicity. I have actually attended a cultural breakfast hosted by government officials whose intent is to promote mutual understanding and acceptance of each other’s beliefs. The breakfast is a regularly scheduled event and my wife loves to take our visitors there. So in spite of the occasional celebrity “Christians” from the USA jetting in to Dubai and doing their best to permanently alienate the Muslims against the Christians while they make some money, I am happy to say things are still generally good for the followers of Christ in Dubai. Todd- Love reading your posts. I have a few questions I was wondering if we could take offline. Can you shoot me an email? Thanks!! Hey Buddy!, I found this information for you: "Still No Need to Blacken the Face in Dubai". Here is the website link: https://thouarttheman.org/2014/01/15/still-no-need-to-blacken-the-face-in-dubai/. Thank you.